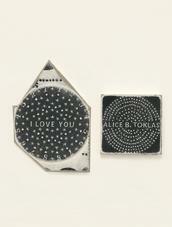 Ray Johnson, I Love You Alice B. Toklas [detail], 1969, collage on cardboard, 27.5 x 17.5 inches. 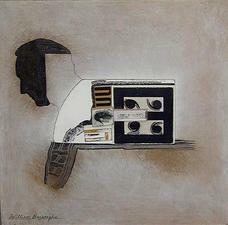 Ray Johnson, William Burroughs, 1978, collage on masonite, 16 x 16 inches. 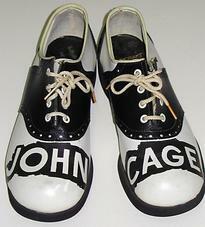 Ray Johnson, A Shoe (John Cage Shoes), 1977, 12 x 8.75 inches. Ray Johnson, Untitled (Johnson Face and Fingers with Cage and Picasso Bunnies), 1972, 1990+, collage on cardboard panel, 17.75 x 17.50 inches. Matthew Marks is pleased to announce Ray Johnson, the next exhibition in his gallery at 523 West 24th Street. 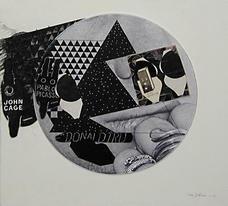 Included are almost forty collages spanning nearly three decades. Ray Johnson is on view at 523 West 24th Street from May 5 to August 18, 2017, Tuesday through Saturday, from 10:00 AM to 6:00 PM.